Cucusoft iPhone Tool Kits is an easy to use software that is intended to assit you in backing up all the files on your iPhone. It enables you to recover any lost or missing songs, videos, books, photos and more. Cucusoft iPhone Tool Kits can readily copy and transfer your iPhone songs, videos, photos, SMS, call list, contacts and books (that was purchased via iBook Store) to your computer. It even allows your iPhone to function as a removable hard disk. 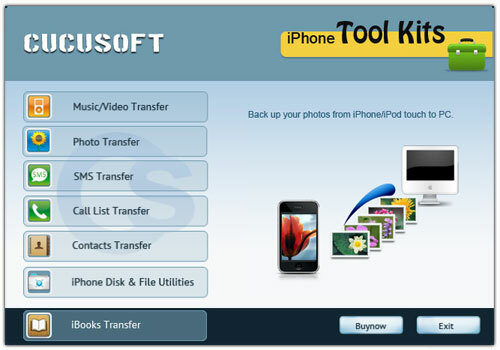 "iPhone Tools Kits" Transfer is a highly recommended utility program to keep your iPhone data protected at all times. Furthermore, it is also compatible with iPad 1, iPad 2, iPad 3, iPad mini and iPod touch. This top-rated and powerful iPhone Tool Kits software is easy to install and fairly simple to operate. It auto-scans, auto-searches and auto-indexes all the files on your iPhone, iPad or iPod Touch by album, artist, genre, and type. You can also transfer Music/Video from your iPhone, iPad or iPod Touch to your computer. You can copy the photos from your iPhone, iPad or iPod Touch and save it to any folder you have designated on your computer. It makes backing up your SMS to your computer a possibility. Enables iPhone to act as a removable hard disk so you can save your own file on your iPhone. It allows you to backup the books you purchased from iBook store. It lets you track down any music or video by album, artist, or genre quite easily. It can support all iPhone, iPad and iPod Touch models. It has an advanced settings support for the Backup Folder Rule . Absolutely no need to install any other media player to play your media files. You can simply play or view the media files directly from our program. Supports multiple languages such as English, Chinese and more. Its compatibility with all iPhone, iPad and iPod Touch models makes it indeed a practical choice. Cucusoft provides a reliable customer support that will always be happy to assist you. You may email your inquiries at support@cucusoft.com.